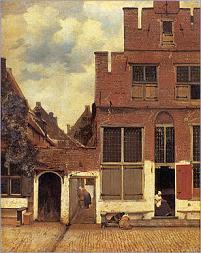 From Monday May 7 till Sunday June 3, a special painting is on display in the Vermeer Centrum Delft: the Little Street of Vermeer. Of course not the real one, but a reproduction. Made by the French artist Mickaël Leroy. Mickaël started copying paintings by Vermeer 8 years ago. At first glance this is not very special, but Mickaël uses a technique that makes a visit to the center definitely worthwhile. Mickaël paints according to the techniques of Vermeer himself. Under the same conditions, made with paint like Vermeer once did. Mickaël studies all scientific discoveries about Vermeer and investigates the artistic context of Delft: the relationships of Vermeer, environment, contemporary painters and everything about the Golden Age. 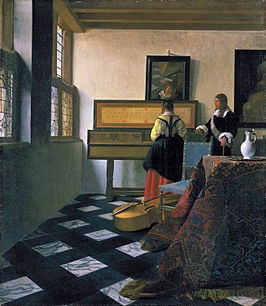 By becoming proficient in Vermeer's painting technique, gaining knowledge about Vermeer and his own experiences gained during painting, Mickaël's copies increasingly approach the original versions. In addition to the painting itself, the exhibition consists of a 3D map of the Little Street, the Little Street made in blocks, a video where Mickaël can be seen at work and much more. Mickaël will be present at our Center on Saturday May 19, from 11 am to 5 pm. He then works on his latest painting of 'the music lesson' and is prepared to answer all your questions (in French or English).